Almost everyone knows that I’m a self confessed chocoholic. My husband swears I only get through some days because of the thought of my evening treat! I’m pretty impatient too, so when I found a chocolate microwave mug cake recipe, I couldn’t wait to try it! I’ve been making this mug cake recipe for well over a year now, and have tweaked it slightly over time, to make it even more delicious. Large, microwaveable Mug (I use one which holds 500ml). Measure all of the dry ingredients into the cup. Put the cup in the microwave on high. (The below times are based on 800w Microwave, so adjust as per your own microwave’s power). Zap for 1 Minute 45 Seconds for a runny, chocolate core centre, or for 2 minutes if you prefer a solid chocolate sponge cake. Carefully remove the mug cake from the microwave. Either eat straight from the cup, or turn it out onto a plate and smother it with custard, ice cream or cream – EPIC! Let me know if you make it, and what you think of it! Considering it takes less than 5 minutes from deciding you want to make this, and sitting down to eat it, I reckon its pretty epic! It satisfies even the biggest chocolate craving too, so make sure you give it a try next time you need a chocolate fix! Find more recipes and lifestyle content here. 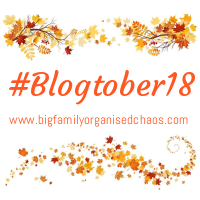 I am linking this old post up with #blogtober for day 16’s “Perfect Recipes For You” prompt. You’re very welcome! Hope you loved it! This looks excellent. I will be saving it and sharing it everywhere. It’s epic. Bad for the waistline, though haha. the girls love making cake in a cups, will definitely be trying this one! Is tonight too soon? It’s so quick and easy. Tastes like one of those tinned steam chocolate puddings or the chocolate sponge cake we used to get at school. Yum yum. KayCee and Ella love making mug cakes. I’ve never tried one but I think I could be persuaded after seeing this recipe! They area so quick and easy to make. My 6 year old loves helping.